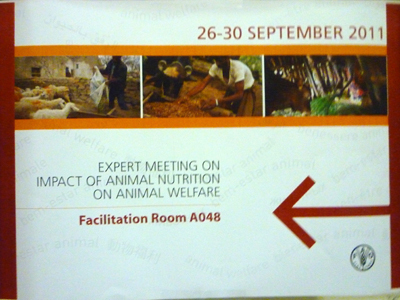 The first international meeting on the "Impact of animal nutrition on animal welfare" was held at FAO's headquarters in Rome from the 26th to the 30th of September 2011. The meeting gathered experts from the European Union, Research Institutes, Organisations involved in animal nutrition, and major international protectionist Associations. The G. Caporale Institute participated to open the debate on current scientific knowledge and share significant technical solutions and lessons learnt with regard to animal nutrition. The objectives contemplated the identification and promotion of feeding options for different livestock production systems capable of improving animal welfare while increasing profitability of the livestock producers and ensuring quality of zootechnical productions as well as safety at work. The meeting emphasised the necessity to support and enhance research activities in light of the identified priorities and the need for advanced knowledge. Special attention was requested for issues such as the physiological mechanisms inducing hunger, the development of immediate instruments apt to detect conditions of chronic malnutrition, and the elaboration of optimal diets with respect to genetic traits of species. Upon the summit's completion, a technical document was devised in order to take stock of the situation on the impact of nutrition on animal health and welfare, and formulate technical advice while promoting short term policies capable of insuring the sustainability of zootechnical feeding systems, reconciling community food needs and livestock life quality.